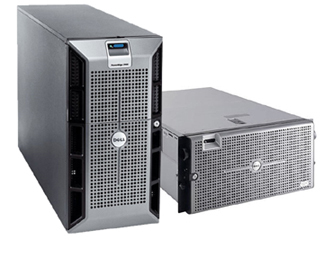 The Dell PowerEdge 2900 comes in either a tower or rackmount configuration. A variation of the popular 2950 rackmount model, the PowerEdge 2900 has a roomier chassis with slots for up to eight (8) 3.5" hard drives and an additional two (2) drives if an optional flexbay is installed. Designed with multi-core technology from the ground up, the 64-bit PowerEdge 2900 finds its strengths in enterprise-level environments from high-end virtualization to database applications. The PowerEdge 2900 will accommodate up to 96GB of RAM and features dual redundant power supplies. There are dual integrated NIC ports and optional remote management features. Building on the dependability and reliability of previous generations, the PowerEdge 2900 establishes itself as a highly sought-after workhorse. Choose a pre-configured system below or Flagship Technologies can build a custom server configuration based on the needs of your current IT project or datacenter. If you're looking for parts for the Dell PowerEdge 2900, please select a category below.